Lakeland’s public library began its existence in 1950 in the courthouse office of the county school superintendent. It remained there for many years before moving to a corner of the Kindergarten building of Lanier County Primary School. Residents considered it a school library because it was only open for use during school hours. Eventually, it relocated to a rebuilt section of the high school. Then, on May 18, 1980, it officially opened its doors as the Lanier-Lakeland Library, which eventually built its collection to a little over 6,000 volumes. Time marched on with progress prevailing and on March 13, 1988, following a property donation of $45,000 by the W.L. Miller family, help from the city of Lakeland and the Lanier County Board of Education, the brand new W. L. Miller Memorial Library proudly opened. Additional funding came from a state grant and contributions from the Governor’s Special Fund. 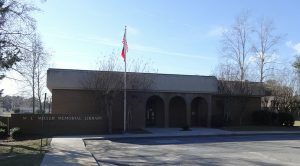 This library was the first of five area libraries constructed under a $20 million Georgia grant building program. Peggy Giddens was the library’s first manager, followed by Betty Bradford. Located in the charm-filled city of Lakeland, home of the Murals of Mill Town, this library is as spirited as the town’s history. The library closed on August 9th 2012 and reopened to the public on August 23th 2012. During that time the library received a makeover that included new carpet, new lights, and a new organization that allowed patrons to move around more freely. Tues - Thurs: 11 a.m. - 6:00 p.m. This library's strengths lie with friendly staff, patron-requested collections, engaging programs, and a relaxing environment. This library is one every patron can be proud to call their home library. Join us for creative activities including LEGOs, games, and crafts. Fun activities including games, crafts, and book talks. Activities and events including crafts and book talks. Prizes, games, and programs are offered as reading incentives. Call the library for information on other special programs!